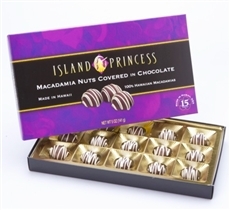 Gourmet chocolate candy and Hawaiian chocolate macadamia nuts by Island Princess Hawaii. Home of the original toffee chocolate macadamia nut. Our custom blended rich milk chocolate with a hint of dark chocolate is the basic ingredient for our chocolate gifts including Deluxe Chocolate Toffee Macadamia Nuts, Classic Chocolate Macadamias, Chocolate Covered Coffee Beans and our newest taste sensation Choco Mochi!